What an interesting and fascinating book. If the Great War reader wants a change from the Western Front, then this is a book to read. 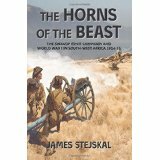 Written by James Stejskal, this book about the Swakop River Campaign and the Great War in South-West Africa, 1914 – 15, takes both the German and South African points of view. This campaign,the South African invasion of the German protectorate of South-West Africa,is a rarely visited facet of the Great War. Britain was concerned by the threat posed by Germany in Africa, therefore it asked the Union of South Africa to eliminate the German communications system in South-West Africa and occupy the Protectorate’s harbours.South Africa was keen to comply, not in the least because this was a chance to expand its own territory. However, the implementation of this request by Britain proved initially more difficult than they imagined.The campaign was one of movement and more akin to the Boer War than the war being slugged out in the trenches on the Western Front or at Gallipoli. James Stejskal does not confine himself simply to writing about the fighting and manoeuvring. The effects of the Battle of the Falklands are examined and show what influence that naval battle had upon South-West Africa. It was not simply a revenge battle for Coronel as it is often portrayed. Stejskal deals with the logistics, the tactical, and the strategic concerns of the campaign. He highlights the lack of German communications secrecy and how the South Africans managed to glean precise intelligence of German forces from the German’s own signals. It is a diplomatic investigation, with a tendency to lean towards the underdogs, which for a change in 1915 is the Germans. The British are in the background and portrayed as puppeteers, which they were in Africa but the power of South Africa as an emerging nation in 1915 cannot be ignored. Only a few short years before the Boers had brought the British Empire to the brink of defeat. South Africa would not have shirked from taking action against the German colony even without prompting by Britain. Well done Helion for find this little gem! It is a useful, informative book with good, clear maps and interesting photographs. It contains order of battle information, there is a ‘Killed In Action’ list for both sides, it has an excellent sources list, a bibliography and an index.The book is short but that has to be expected. It was a relatively short campaign and for the colonists, against the might of their neighbour South Africa, it was a forlorn hope. For any reader wishing to expand their Great War library, this book will fill a gap on the shelf. The Swakop River Campaign And World War I In South-West Africa, 1914 – 15.